This latest Super Angel Juicer 7500 all stainless steel juicer prepares healthy juice for you and your family. It is made of stainless steel and non-toxic plastic. With Super Angel Juicer 7500 you can extract juices of almost all juicy fruits and vegetables like apples, carrots, oranges, wheat grass, barley grass, sprouts, herbs and many more. Along comes with Super Angel 7500 is a measuring cup made with BPA-free Pyrex glass which is brand new! I have been juicing my whole life, and have owned many juicers. My first was my mothers champion 35 years ago. There have been several champions worn out since then. If only I had known about this juicer sooner! I received it today, and five minutes later I put it to work. Leafy greens, no problem, bell peppers, cucumbers, fennel, apples, carrots, celery, I couldn't stop myself! I had to try them all. When I finally came to my senses I had to taste it, wow! As good if not better than what I have tasted from a Norwalk. Then I examined th pulp, no recognizable seeds, threads, or anything else. Just some of the driest pulp I have ever seen. Now clean up... it was easy! Rinse the augers, scrub the screen, and wipe down the machine. Done, why didn't I buy you sooner? Pretty sure this will be the last juicer I ever buy. Worth the investment. Superb service and exceptional product! Truly appreciate the customer service (including call back based on a question in my order)! Received the product quickly and on projected schedule and it is an excellent juicer! I have been using it daily since it's arrival! Thank you very much for the outstanding customer support and product superiority! Absolutely Love It. So easy to USE. This juicer is totally worth the money. I am using it everyday now and sometimes two times per day. Juicing is so essential for my health and well being. I had a Champion Juicer in the past. It is so hard to use and clean. And it was so messy. So I ended up NOT using it. 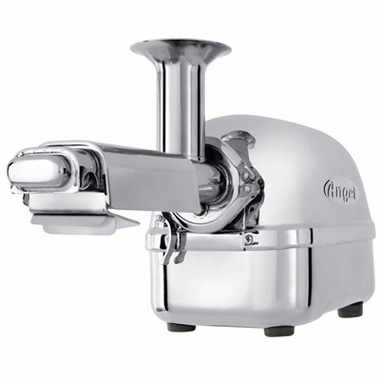 With the Angel Pro Juicer, I am excited about trying out all the different juices I can make. I've had my Super Angel for 3 years and use it 2x week. I'm 77 and truly feel the delivery from the super nutrition it provides. I was so convinced that I bought one for my granddaughter and her family. She has 2 young children and a husband that make a party out of juicing up all their favorite foods! Only organic, of course. You will love it and will love the effects of the good food you'll be drinking.! To your health!! So far our juicer is working well and producing great juice. I was a little surprised at how much work it is to clean but I've turned that into a blessing. The juicing book came folded in half. You've got to run it over w/a truck to flatten it out and it still is folded in half. Makes trying to read the recipes difficult @ best. I like this juicer very much except for the very small flimsy gasket which is very hard to put on. Powerful machine. Does a great job on greens, veggies in general and a few fruits, but not most fruits. Haven't found any juicers that weren't a bit of a pain to clean up, this one included. There is a rubber gasket around one of the parts that seems like a cheap addition to the expensive mix of equipment that I think should be better quality. I have had them tear and break on me and have had to replace them within 6 months. Otherwise an awesome juicer that can tackle the task. Once placed in air tight jars, juice lasts well up to 3 days, too.